Pinnacles National Park has interesting rock formations and Talus boulders that are unique and good for rock climbing. Drive to the east entrance via highway 146. Stop by the visitor center to get maps and advice. Continue to High Peaks – Condor Gulch loop if physically able to tackle the 5.3 mile loop with 1300 foot elevation gain. If not, return via Moses Spring Trail. One day is enough to enjoy the park. If you have more time, drive to the west entrance the next day and hike the Balconies Trail. National Park Service closes the caves periodically for bat nesting. Check before you go. Pinnacles National Park is known for spires, high peaks, Talus boulders, flowers in the spring, and countless small animals, insects, and moths. 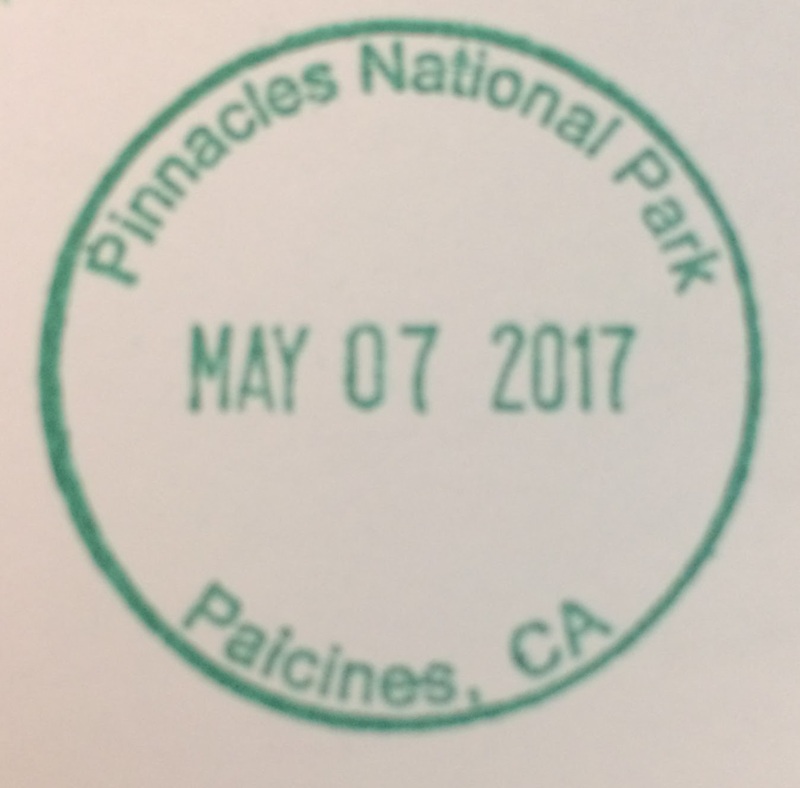 It’s a small park (ranked 55 out of 59 national parks) and the second newest national park designated in 2013, although it has been a national monument since 1908. It offers rock climbing, camping, hiking, and Talus caves. There are two entrances; one on the east side and one on the west side but they do not connect and it’s a 90 minute drive to go from one side to the other. The east side has better services and a visitor center housed together with a gift shop and a small desk in a brown rustic building. The west side only has a “visitor contact station”. Park has limited facilities. From the east side, the main attraction is the Bear Gulch day use area, the trail head to Bear Gulch Cave Trail and the High Peaks trail. The facilities in the park are too small to handle even the limited number of visitors. On weekends, the limited parking spaces fill up quickly. A shuttle bus brings visitors from the visitor center to Bear Gulch but there is only one shuttle and it only holds 24 people. We waited 15 minutes for the shuttle and could not get on so we had to wait another 20 minutes to get on the shuttle. The Moss Spring – Bear Gulch Cave – Rim Trail loop was the highlight of the park. This 2.2 mile round trip from the Bear Gulch day use area went through Bear Gulch Cave (when open), up to a reservoir, and loop around the rim of the spires. The hike was fun for adults and children alike with a little of everything on this hike. We walked through a narrow canyon, caves formed by Talus boulders, weaved through steep steps, ducked under rocks, used a flash light in totally dark caves, and walked across small streams with stepping stones. Each of these sections was short and interesting. The variety made it fun because I could not predict what was around the next corner. The path led to Bear Gulch Reservoir which had dark water and a stagnant feel. There were many dragon flies, including a red one we saw, that flew around the reservoir. This trail would be very nice if only there were fewer visitors. Pinnacles is close to San Jose and it gets a lot of weekend visitors from the south bay area. It seemed like everyone went to the Bear Gulch area, which was understandable since it’s the highlight of the park. Many families with young children were on this trail, walking slowly. 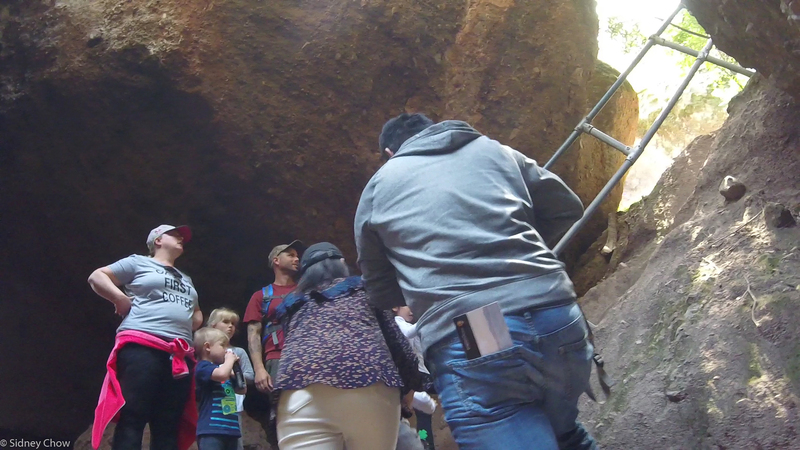 I have nothing against families with small children and I’m glad they came to hike, but due to the large number of people and the very narrow trail, there were frequent stops while waiting for children or people coming the other way. The trail was backed up as if we were in a queue at Thunder Mountain Railroad at Disney World. In fact, the trail looked like the queue at Disney World. How Much can a Six Year Old Talk? We followed a family with two girls about three and six years old. The older girl kept talking and asking questions throughout the cave part of the trail. She was clearly excited but she kept asking her mother if she enjoyed the hike, every 30 seconds! In between her questions, she told her mother how much she liked a particular feature of the hike. This went on for 30 minutes! Her mother had the patience of a saint and answered her daughter each time she asked. The excitement is understandable but the incessant questions – the same questions – over and over again, is annoying. We tried to wait or go ahead, but the “queue” just put us back within earshot of the girl. I can only imagine how nice it would be to explore the trail in silence. There were “theme park” people who wear flip-flops and talk loudly, and “national park” people who wore hiking boots, with hiking poles, and hats. On this trail, they were about half / half. Most people were considerate but there were just too many of us. There were more people than the trail can handle. These caves are not underground caves like Mammoth or Carlsbad Caverns. 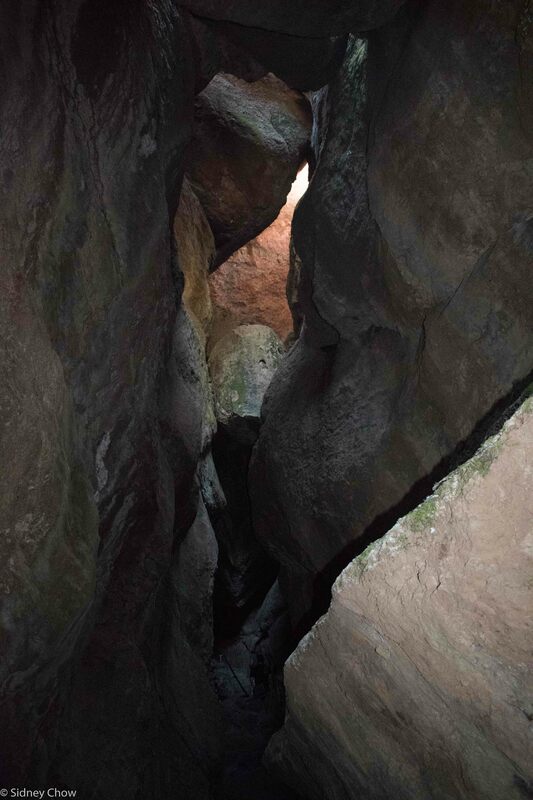 These caves were formed when large boulders fell on top of narrow canyons. The actual cave is very small, more like a tunnel than a cave. I felt like an explorer navigating my way around boulders and ducking under them. It’s short but fun. The dark areas that required a flashlight was only 100 feet long but it is nearly impossible to navigate without it. It was very humbling to look up and see house sized boulders perched between slot canyon walls, ready to fall down at the next earthquake. The Rim Trail followed along side of a spire with decent views of the namesake Pinnacles. Most people returned from Bear Gulch Reservoir via the same Bear Gulch Cave trail so there were far fewer people on the Rim Trail. 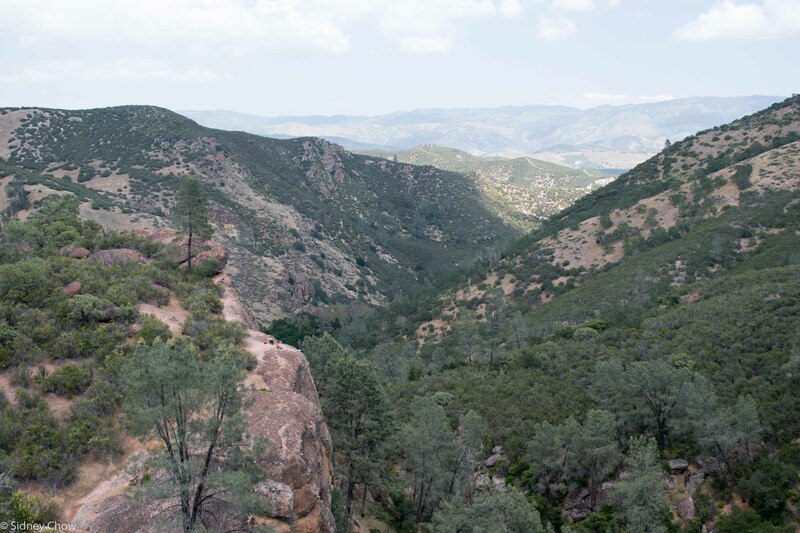 To get a true sense of the Pinnacles, you needed to hike the High Peaks trail, with even better scenery than the Rim Trail. The High Peaks – Bear Gulch was a 6.7 mile loop with an elevation gain of 1425 feet. This trail took us through meadows, climbed near the peaks and descended down narrow steep trails. Chalone Peak Trail takes you to the highest point in the park – South Chalone Peak at 3269 feet. This is a 9 mile round trip from Bear Gulch reservoir. The highlight of the west side of the park is the Balconies and the Balconies Cave Trail. 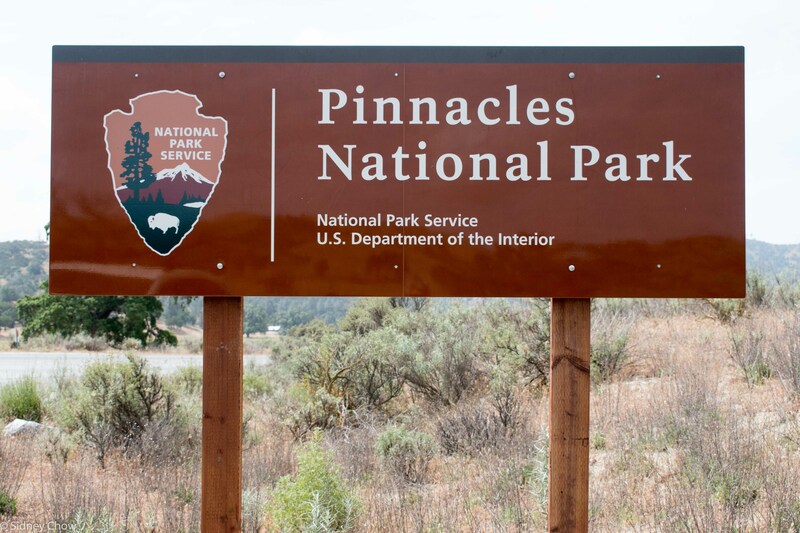 While you can spend 90 minutes to drive around to the west entrance and take on the very winding highway 146, you can also get there from the east side on foot by parking at Old Pinnacles Trail head parking area, and hike the flat 5.5 mile round trip trail. When the outlook is dark, that is the time to deepen the resolve and push ahead, just like tunnels under Talus boulders are short and the light is just ahead. Pinnacles National Park is a small park and there is nothing to see from a car. The scenery is interesting but hardly spectacular. The spires and boulders are not very dramatic and the Talus caves are interesting but short and small. The trails are pleasant but hardly awe inspiring. The flowers are good to see in the spring time but did not have the wow factor. This is a pleasant place to visit for some hiking, rock climbing, caves exploring, but hardly rise to the high standards of a National Park. The facilities are limited. This is not up to the high standards of a National Park. Have you visited Pinnacles? Leave a comment below on your experience. Click on the Follow link and get an email when new postings are available. I will not share your email so no worries. Visit on weekday to avoid the crowds. Summer can get above 100 degrees F. Mid-February to early June is the best time to visit. Unless you want to do a lot of hiking or rock climbing, one day is enough for this park. There isn’t much to look at from the car. You have to hike to see the scenery. Hollister is the closest town of any size. It has all the facilities but it’s also not very far from San Jose. This can be an easy day trip from San Jose area. Bring your food. There is no food available inside the park. There is no gas in the park. On weekends, be prepared to take a shuttle to Bear Gulch area from the visitor center. Visitors: 215,555 in 2016, ranked 47th. Record was 393,219 visitors in 2011 while it was still a national monument.